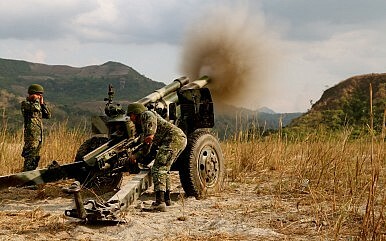 Live Fire Exercise During Balikatan 2013. The annual exercises are set to double in size. The United States and the Philippines are set to double the size of their annual war games to be held later month, with some exercises staged close to a South China Sea flashpoint, Philippine officials said Monday. According to local media reports, more than 11,500 U.S. and Philippine troops – around 6,600 U.S. troops and 5,000 from the Armed Forces of the Philippines (AFP) – will take part in this year’s Balikatan exercises, reportedly the largest number since 2000. Balikatan 2015, which will be held from April 20 to April 30, will feature three activities: the command post exercise, field training exercise and humanitarian civic assistance. The United States will be sending 76 air assets and three ships for the exercise, while the Philippines would deploy 15 planes and one vessel. Australia is also expected to take part all three parts of the exercise, and will be sending personnel and an aircraft. Philippine military spokesman Lieutenant-Colonel Harold Cabunoc said the expanded war games this year reflected the deepening alliance between Washington and Manila, which both inked the Enhanced Defense Cooperation Agreement (EDCA) last April. EDCA is still yet to be approved by the Philippine legislature. “The higher strength of Balikatan 2015 for this year only reflects the Philippines’ and the United States’ growing commitment to enhance our capability to conduct joint military and non-military activities,” Cabunoc told Agence France-Presse. Part of the exercises will reportedly be held from Zambales naval base, which is located 220 kilometers east of Scarborough Shoal in the South China Sea which Beijing seized from Manila back in 2012. But Cabunoc clarified that the joint exercises were not aimed at countering China or responding to its extensive land reclamation activities, which the Philippines has been taking aim at with its pending arbitration case against Beijing (see some of The Diplomat’s coverage here and here. “This has no direct relationship with the ongoing construction of structures, not a show of force,” Cabunoc said. Balikatan 2015 will be formally opened April 20 at the AFP General Headquarters in Camp General Emilio Aguinaldo in Quezon City. What’s Next for US-Philippine Military Ties? A brief look at what might lie ahead for Washington and Manila.